Some information on the owner of this site. My Name is George Scoble. i am an ex 6 h/c golfer (now at the age of 75 playing off a H/C of 14). I have since retired from running my own import and distributing business dealing with Bathrooms. 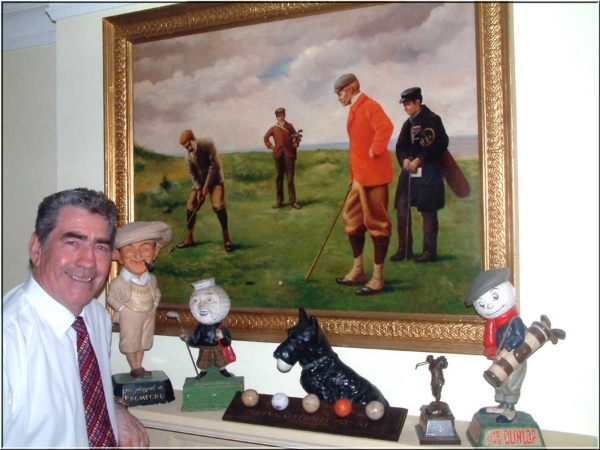 I have been collecting golf antiques since 1984. Some 12 years ago i started selling my collection online but ultimately found the website i was using too old fashioned and difficult to maintain. Hence this new site. a. All items clearly priced. b. Prices include shipping "free of charge" (anywhere), inclusive in the advertised price. c. Detailed close up photography that in many cases gives a better view than the naked eye. d. a full refund (excluding return shipping) if you are in anyway dissatisfied with your purchase. e. Details of any known restoration. f. Direct email exchange with myself on any points regarding the proposed purchase. g. Shipping carried out within 3 working days of payment.